For much of this past Saturday, I was feeling exceedingly good about myself. My wife Paula and I spent the morning at the Bat Mitzvah of a neighbor of ours, a thirteen-year-old who showed considerable poise during the lengthy service. Afterwards, the girl’s grandmother, an author of novels for young readers, complimented my blog, as did our representative on Somerville’s Board of Aldermen. Late that afternoon, I rode my bike at a brisk pace to Lexington, a 15-mile round trip. As dusk was settling in, I turned back toward Somerville. I’d had the foresight to bring along my detachable headlight, along with a day-glow vest. Since Lexington is at a higher elevation than Somerville, most of the ride home was downhill. Other riders were scarce, and I appreciated the darkening solitude. I could feel myself breathing, the essential act of life, and I was experiencing the bike rider’s equivalent of runner’s high. I felt like an athlete in his prime. In this exalted mood, it was possible to fantasize that my diagnosis of Alzheimer’s was a mistake. Once I returned home, I took a hot shower, dressed, and began to prepare our dinner, a pumpkin melange that Paula and I have been making every autumn since the late nineties. It is not particularly challenging. Peeling the pumpkin is a pain, but things were moving along. A few minutes later, I realized that neither of us had remembered to saute the red onion, and that the dish would not be as satisfying as usual. Either the onions would be too harsh, or the apple sections would disintegrate in the heat. I was mildly agitated. I enjoy cooking, and I like to do it well. One of the first things I did after I was diagnosed was to label the dials for each of the four burners on our stovetop—front left, back left, etcetera—rather than relying only on the configuration of red dots. But in this case, instead of turning on the large left front burner, I turned on the small left back burner. This would not have been of consequence if the burner had nothing on it at that time. I would have noticed the glowing ring. But I’d laid the large Pyrex top of our Dutch oven over it. The result was predictable. When I touched it with a knife, the glass top disintegrated. So did my composure. Is there any more stereotypical image of Alzheimer’s as someone leaving a burner on? Paula, among the calmest human beings I have known, said almost nothing about the incident. But she did mention that, two months earlier, when I was about to leave for Logan Airport, en route to Germany, I left that same back burner on, though at the lowest setting. Recalling these recent incidents made me think of the day of Christmas Eve in 2013, when, though I didn’t yet know it, I was experiencing symptoms of Alzheimer’s. The previous day I had intended to sign off on a project I was managing, the program book for my organization’s annual conference. But, as often happens when a publication is close to going to press, there were new edits to make, and I arranged with the design firm I was working with to facilitate this. Christmas was on a Wednesday that year, and my office was closed on the day of Christmas Eve, but the design firm intended to stay open until 1 p.m. I finished up my Christmas shopping first thing in the morning, and I was back at my house by mid-morning. Every Christmas Eve I make a ginger-carrot soup, which includes white wine. Drinking a glass of wine alone almost always makes me contemplative, and I remember admiring the georgeous purple hues of the afternoon’s winter sunset. Then, alas, I remembered. I immediately called the design firm, but, as I already knew, the office had closed. No one answered. I felt ill with worry. It seemed conceivable that the delay in sending the electronic files to the printer could lead to the program books not being ready in time for our convention. The day after Christmas, I did get in touch with my main contact at the firm, and I learned that we had more time to sign off on the project than I’d realized. This phone conversation took place while I was visiting the American Textile History Museum in Lowell with my son, who was home from college. I was, of course, relieved. But I did not enjoy my visit to the birthplace of the American industrial revolution, despite experiencing the sound and fury of a full-scale nineteenth-century textile factory, where children worked with cotton in their ears. It is still a place I associate with Alzheimer’s. After I sent this blogpost for Paula to proofread, she noted that my recollection of the kitchen accident was inconsistent with hers. She was not in the kitchen when the accident occurred. I will have more to say about unreliable memory after I finish Greg O’Brien’s memoir, On Pluto: Inside the Mind of Alzheimer’s. When I worked on my college newspaper in the early eighties, some of us typed our articles on rolls of brown paper, otherwise used for the drying of hands. One reporter, of limited stature, typed stories as long as he was. Though I owned an electric typewriter, in the newsroom, like everyone else, I pounded out my stories on battleship-gray manual Royal typewriters, well-known for their durability. 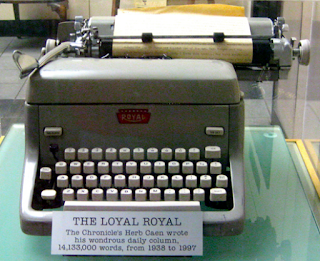 Columnist Herb Caen, a fixture at the San Francisco Chronicle for almost sixty years, is said to have used the same Royal for his entire career. In our newsroom, a friend who also played on the football team amazed our colleagues by carrying one of the tank-like Royals across the room in one hand. When I graduated, my mom bought me a Pentax K2000 camera, which, like the Royal typewriter, had a reputation for durability. As a young reporter on a newspaper in Connecticut, I was required to take my own photos. I also learned that it was possible to drop my K2000 and not seriously damage it. One thing I appreciate about that camera is that I more or less understand how it works. The camera lets in the appropriate amount of light to enable the creation of a durable image on specially treated film. Somewhere in my attic is a large black-and-white print of me when I was ten years old, decked out in my Little League uniform and catcher’s gear: face mask, chest protector, shin guards. In the photo I’m preparing to catch a simulated pop fly. But anyone with knowledge of baseball would notice that something is askew: The photo implies that I’m wearing a catcher’s mitt on my right hand. All catchers, even in Little League, are right-handed, and wear their mitt on their left hand. This photo was not professionally developed. Friends of my brother, who was fourteen, set up a darkroom in their house. The kids who developed the photo did it backwards. My Pentax camera was fairly easy to use, but nowhere near as simple as today’s digital cameras and smartphones. The film cassette fitted over a vertical spindle on the left side of the camera, and the roll of film began with a tapered leader that ensured that the film would advance. Film did not advance automatically. You had to push with your thumb a lever on the right of the camera. It was important to pay attention to the light meter. If the needle rose significantly above the midpoint of my gauge, the pictures would look washed out; if the needle was too low, the photos would come out dark. Auto focus was not an option. A separate dial on the camera’s detachable lens was used to bring the image into focus. For taking photos indoors, it was necessary to slide in the flash unit above the camera. The camera, now thirty-one years old, still works, though the flash unit died many years ago from acid leaching out of a dead battery. Today, of course, digital technology is everywhere – in the music we listen to, in most of the movies we see, and, of course, in the zillions of photos on Facebook. Which raises a question: Does the glut of digital information make us more informed? Or less so? Could we perhaps have a few less cat photos and videos? Disclosure: I posted photos of one of my cats earlier this week. He was roaring after waking and discovering that there was multicolored yarn on his head. Sometimes I give in to the spirit of our age.